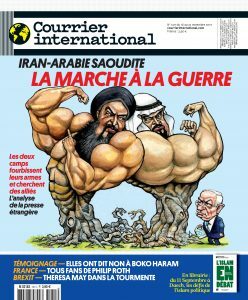 This week I was commissioned to produce a cover for the French magazine, Courrier International. The subject was the rising tensions in the Middle East between Iran and Saudi Arabia. I created one version of the art with a dramatic back drop. However due to space constraints the background was cut so the titles could be read. The original and final art art above.